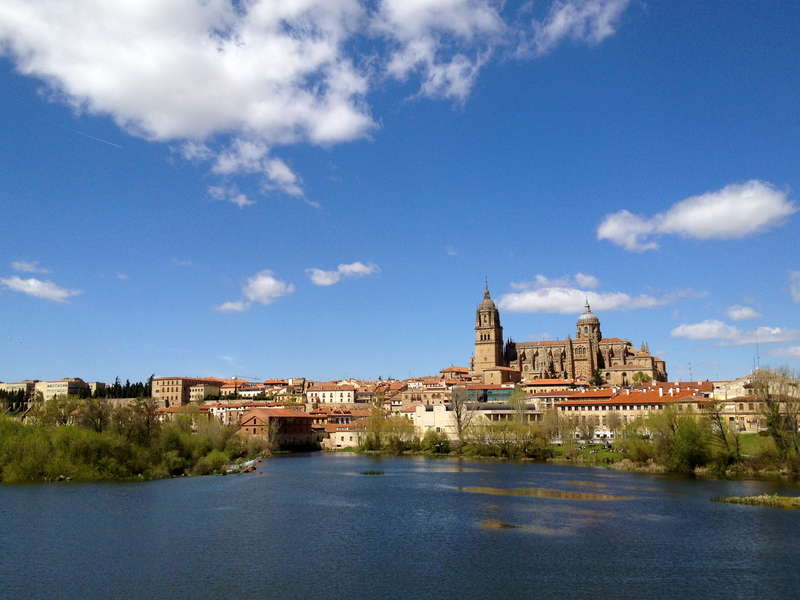 The souvenir shops of Salamanca are full to the brim with little green frogs, largely horrendously bastardised tacky creations with google eyes and a “thumbs up” gesture, frogs donning mortar boards, others wearing baseball caps. You get the picture. So what are all these frogs in aid of? It has nothing to do with the city playing host to a frog-friendly wetland habitat (the river is more likely to play host to the many fag ends and other detritus left over from the revels of Salamanca’s students who regularly gather on its banks in weed-smoking masses). Rather, the humble frog has become the symbol of the city owing to the very inconspicuous inclusion of a tiny carved frog in the stunning plateresque facade of the University. So inconspicuous in fact is the frog that it has long since become the subject of a traditional hunt for any student or visitor to the university: He who finds the frog will, tradition dictates, be lucky. Predictably the tradition has been repeated in every tourist patter, and large groups of tourists are frequently to be found staring up at the sensationally complex facade with strained faces. The frog is in here somewhere - can you find it? I found the frog straight away. The problem is, I had already visited the university shop, where its location was at least partially given away by the multitude of frog postcards sold therein. Not to mention the fact that all the Japanese tourists were pointing in one direction, which kind of gave the game away. I’m nonetheless hopeful that my quick witted discovery, based on deductions stemmed from postcard clues and the careful observation of tourist behaviour, will lead to luck of some sort. Or perhaps it just emphasises a point I have often made: you make your own luck in life. Well, you may as well try it out – I’ve included a photo above of the general area of the frog (thus giving you a head start) – see if you can find it! You never know what luck it may give you. Sensing the potential profitability out of all this froggy fuss, the neighbouring cathedral has not allowed itself to be outdone. 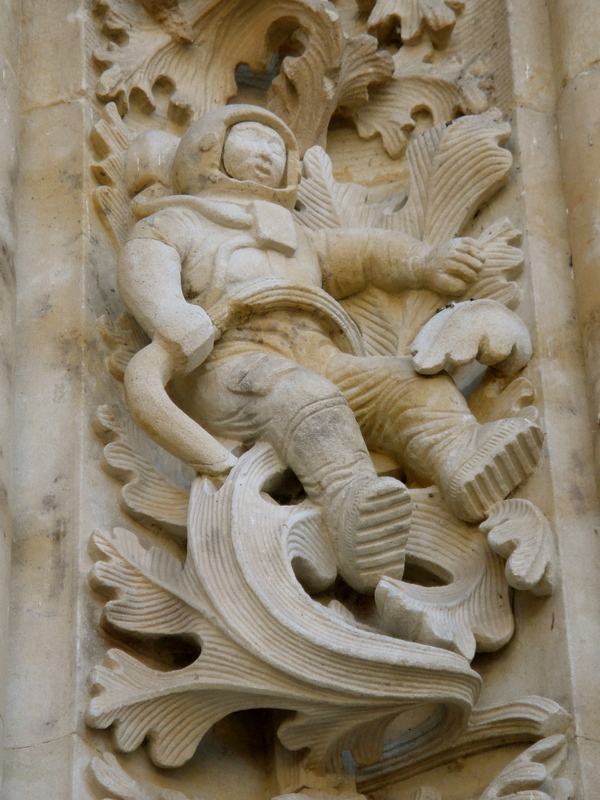 Within its equally complex facade, some cheeky renovators recently added an astronaut floating in amongst the pre-existing baroque foliage, as well as a mythical wolf like creature grasping an ice cream cone. 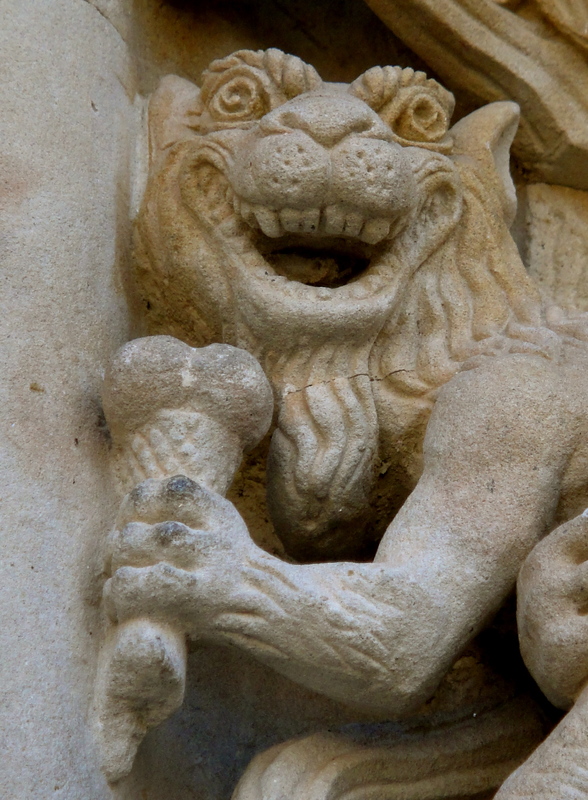 I adore both additions, and love the humour which has been so readily embraced by the Cathedral authorities. Can you imagine a similar attempt by restorers of an ancient building in England? English Heritage would be all over them with threats and protestations quicker than an ice cream could melt. The only trouble is, you can spot the renovated pieces of sandstone quickly enough, and thus finding this cheeky twosome amidst the older, more eroded stonework can be done with a degree of ease. This does not detract from their charm however, and unlike the frog, they’re big enough, and sufficiently unweathered enough, to actually appreciate! 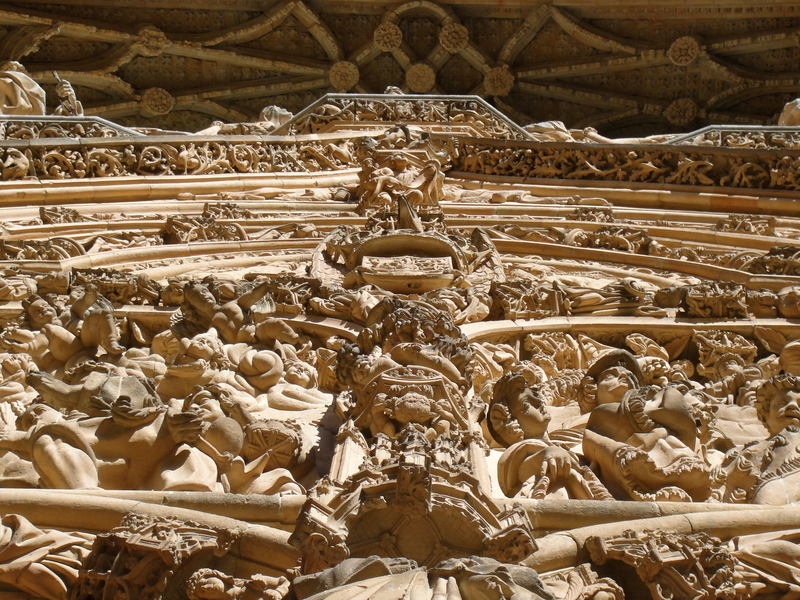 Whatever their contents, there is no escaping the stunningly elaborate and incredibly detailed building facades which literally choke the streets of Salamanca with their excessive virtuosity. 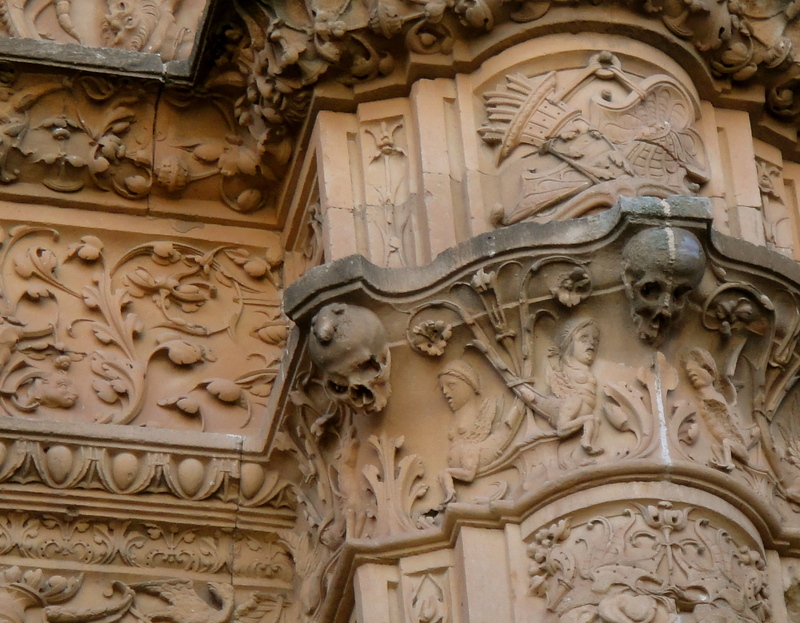 These “plateresque” facades, so called because they are overtly elaborate, thus resembling silver work or “plata”, are synonymous with 15th and 16th century baroque architecture in Spain, but are all the more stunningly executed in Salamanca in the local Villamayor sandstone, the like of which enabled the stonemason to carve with even more precision, but which also gives a glimmering golden glow to the finished product. 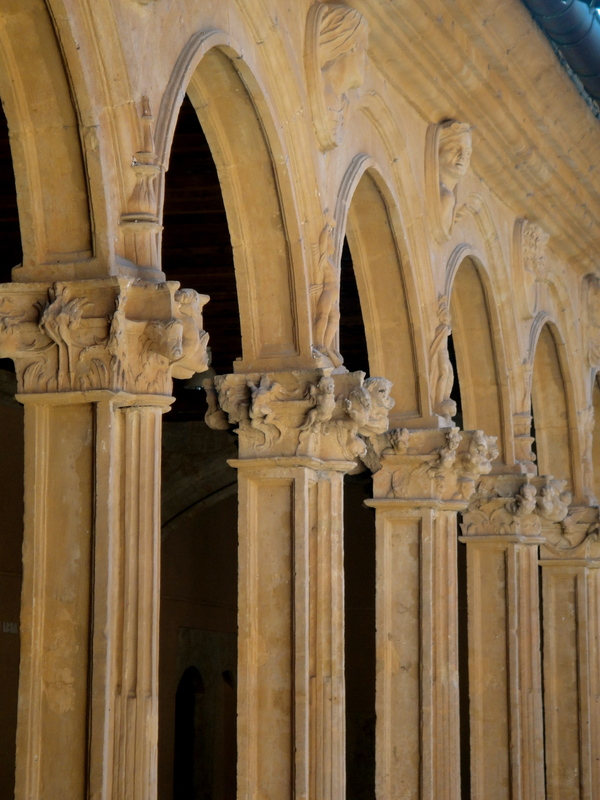 Asides from the breathtaking examples of stonemasonry covering the cathedral and the university facade, another standout example is to be found on the facade of the Convento de San Esteban, our next destination. 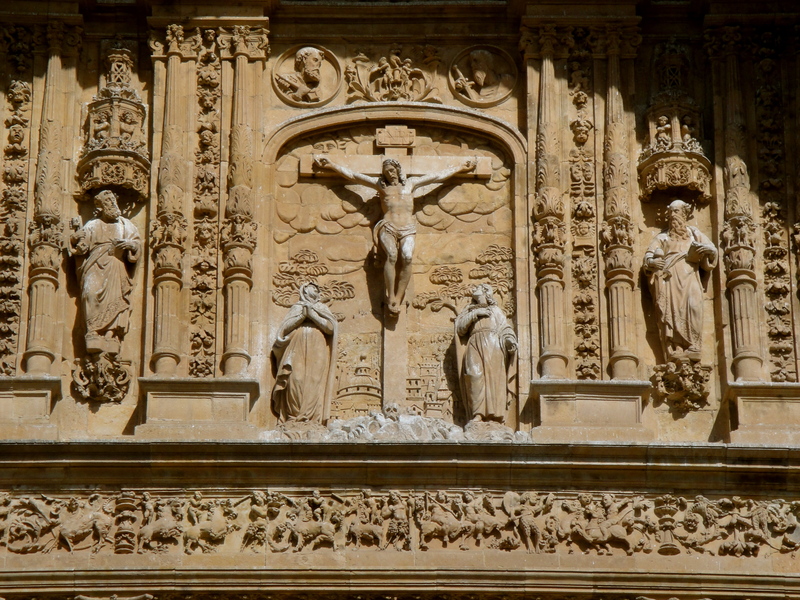 The facade is nothing short of extraordinary, rising like an altar over the southeastern corner of the city, depicting the stoning of San Esteban (St Stephen) as its central motif. The detail of the work is mind blowing – I just hope that it survives the sustained attack of natural erosion upon its delicate forms. Past this beautiful facade and into the convent, we found an equally stunning Gothic-Renaissance cloister, a space of such tranquility that, with the sun streaming through the long gothic windows and only the sound of quiet birdsong emanating from the carefully tendered gardens, one finds the ability to think and reflect more clearly than ever before. 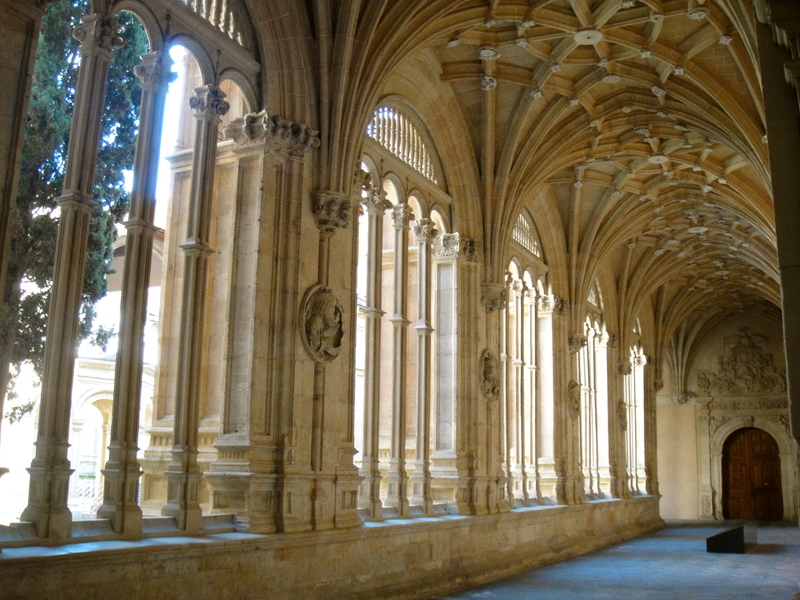 This cloister was like a place of epiphany. I fell almost trancelike into uninhibited introspection as I walked around the cloister and around the magnificent adjoining church, feeling my mind, body and soul slowing to a different pace of life, all the buzz of city life left behind, and my eased spirit released into the tranquil empyrean all around me. It was pretty difficult to leave I can tell you. I felt bad that we had only paid €2 to get in. It seemed an insanely small amount of money for the benefit we had received in return, especially compared with the university, where a €12 admission fee was charged to look around a few dark old classrooms and a library which you can’t enter but are forced to view from behind heavily protective perspex. 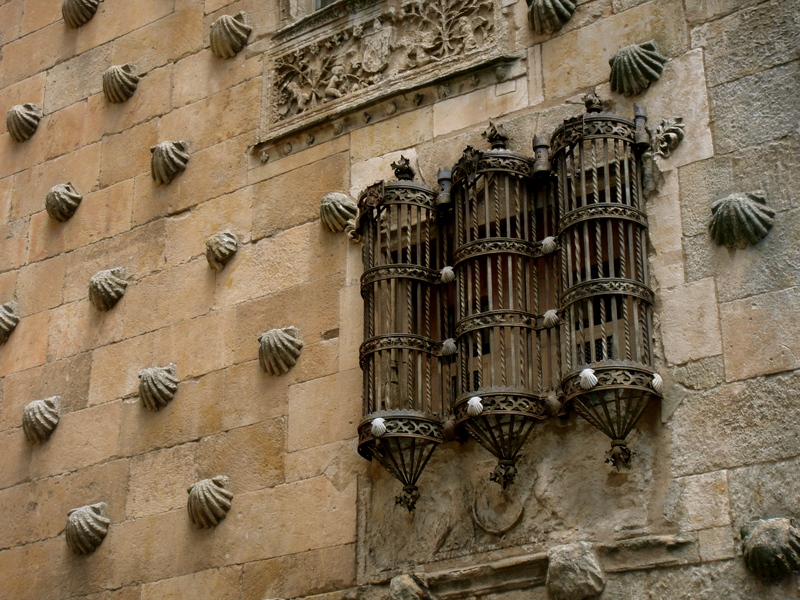 Back into Salamanca, yet more architectural gems lay in wait – like the Casa de las Conchas, one of the city’s most endearing buildings, named after the several hundred scallop shells which cling to its facade and are even wrought in iron onto the front door. Surely this house had to have inspired Salvador Dali when he went about designing his theatre-museum in Figueres? 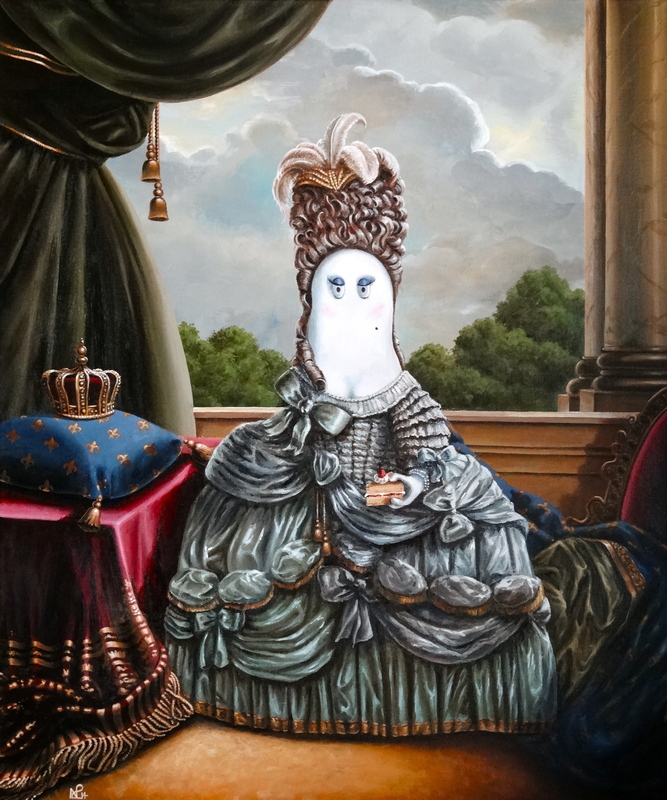 It is thought that the shell symbolism stems from the shell symbol of the ancient Order of Santiago, of which the house’s original owner, Dr Rodrigo Maldonado de Talavera, was an evidentially proud member. It certainly makes for a novel site in amongst the more complex facades which otherwise dominate Salamanca’s old town. With the sun starting to fade and Salamanca taking on that familiar peachy hue, we took the opportunity to gaze at the architectural splendours from afar – walking over Salamanca’s ancient Roman bridge to the other side of the river. Not only were we greeted by the picture-postcard view of the city, we also found a guilty pleasure – an empty children’s playground and a pair of swings. We couldn’t resist squeezing our adult bottoms into those swings and setting off into the air, a feeling of unadulterated childlike pleasure in an adult world, memories of our youth flooding back as the wind swished past us and our stomachs lurched as the swinging motion took hold. Frogs, astronauts, ice creams and swings – in a city where imposing and austere church buildings dominate, there is still an ascendant feeling of fun, a feeling augmented by the city’s thriving student population which breathes youth and vitality into the arteries of this historical monument to Spain’s rich architectural, educational and religious heritage. © Nicholas de Lacy-Brown and The Daily Norm, 2005-2012. 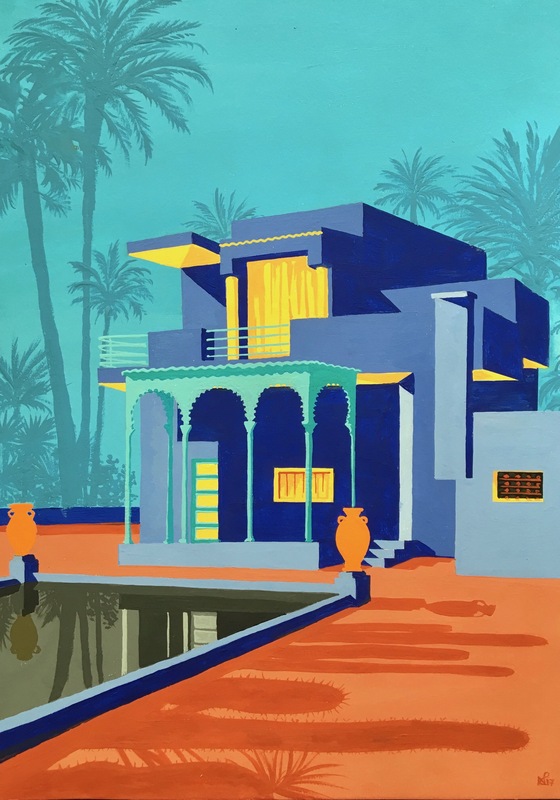 Unauthorized use and/or duplication of the material, whether written work or artwork, included within The Daily Norm without express and written permission from The Daily Norm’s author and/or owner is strictly prohibited. 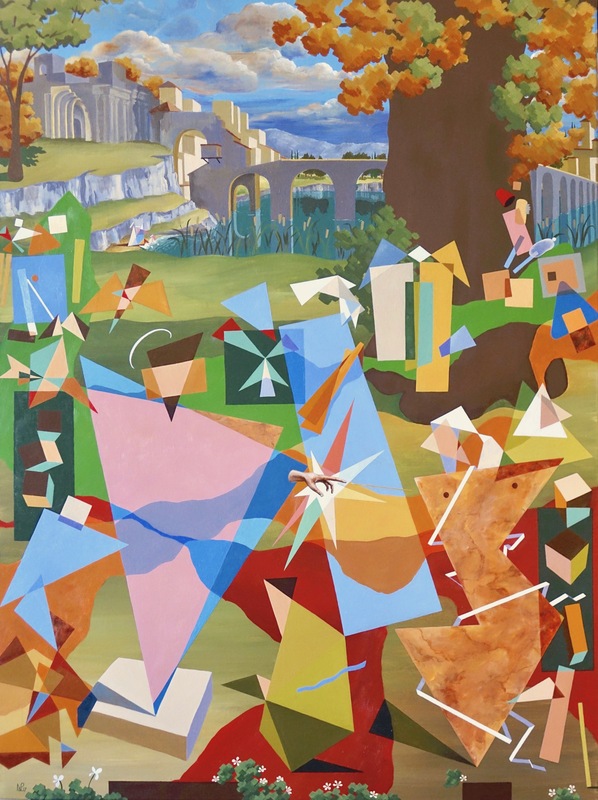 Excerpts and links may be used, provided that full and clear credit is given to Nicholas de Lacy-Brown and The Daily Norm with appropriate and specific direction to the original content.